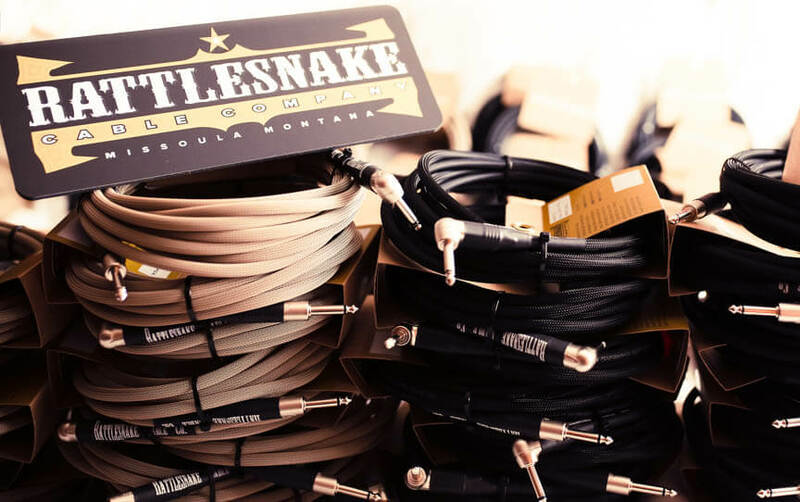 Rattlesnake Cable Company - Offering high quality instrument cables at affordable pricing. My name is Hank Donovan and I started Rattlesnake Cable Company when I began researching for the cable of my dreams. For years prior I've been involved with electronics ranging from pedal building to instrument repairs and to other various nerd projects. I always enjoyed working on music related projects and thought making a great cable would be something fun and satisfying to pursue. I began ordering various components from plugs to cable to protective weaving, etc. I finally found the combination that met all of my needs; I was really excited about the final product. As a guitarist, I wanted to achieve certain goals. Obviously, signal was the primary goal. I've owned various "quality" cables and I wanted to surpass the quality of those cables. I've always been a believer of quality in the cable (both in signal as well as durability) so this was going to be a tough task. If you.re not too familiar with capacitance in cables, here is a quick simple explanation. Some cables begin to bleed off the high end and signal, especially with longer runs. The cable itself becomes a capacitor, and to address this, we have our Oxygen Free Bare Copper (OFBC) low capacitance cable manufactured here in the United States to preserve that high end. Additionally, I hated cables that tend to be noisy or worse, cease to work due to the shielding being weak or easily broken. The cables we use have a strong heavy braided shielding with 95% coverage. This makes the cable super heavy duty... and quiet! Finally, I wanted strong, quality plugs, Neutrik ended up being the winners. The plugs are great quality and their cable clamp system adds more protection for the cables by securing the solder connections. All of these pieces are what ended up creating Rattlesnake Cables today. When I plugged in my first prototype I was immediately blown away by the clarity, punch of the signal! I used a protective weaving to help prevent cable binding and I had something I was very happy with! Originally, I assembed the cable for myself, but as soon as other musical friends of mine started seeing, hearing and feeling the cables, the requests started coming in for cables... and the company was born. The response has been fantastic and seeing these cables on stage with working musicians is something very special for me! Rattlesnake Cable Company is based out of beautiful Missoula, Montana where I'm very proud to call my home. What started with a simple idea for me has grown into a family business where my wife and my kids have become involved with the operations. Each cable is assembled and tested by myself and are made "to order". Each cable is play tested after assembly. They're not simply tested through a cable tester for continuity, but played to determine if the tone is 100% there. I look forward to building your cable! Here are a few ideas that should be a slam dunk for the musician in your life! Gift Card is an easy choice. Let them make the hard decision! 10oz tumbler with lid! Let them drink in style. We have a great selection of Rattlesnake hats! Gift Packs! Check out these bundle deals! Our TRS Cable is a dual conductor cable with the same outside diameter as our standard instrument cable. Cables use Neutrik Gold TRS plugs. If you're looking for a great TRS for your instrument or studio needs, look no further. Speaker cables use beefy 12 AwG dual conductors cable. We only offer jumbo Switchraft 188 straight plugs for our Speaker cables. Neutrik SpeakOns are also available as a plug option. Our XLR cable uses our dual conductor cable milled in the United States. All XLRs use Neutrik Pro-Grade Nickel Plugs and come standard with no-weave (bare). Junction Box is a way to connect two cables. Inside our powder coated, laser engraved is an actual Rattlesnake Cable connecting the Neutrik mono jacks. What a great way to drink your favorite beverage in style! Grab yourself a Rattlesnake Cable Company pint glass featuring our star logo in black ink on quality pint glass! Pick tins are great to hold your picks, earplugs, coins, etc. These are Altoid ™ style tins, matte black powder coat and with our Rattlesnake logo laser engraved on the lid. Mount it on your board or throw it in your guitar case! Rattlesnake Cable Company Hat - Park Ranger. This is a Richardson Structured, mid-profile, six-panel hat in a very park-y green. These are using our star logo on a leatherette patch. Rattlesnake Cable Company Hat - Richardson Washed Chino in Black. These are 100% cotton, unstructured, low profile six-panel hats with cloth baskstrap and flip buckle. These are using our star logo on a leatherette patch. Rattlesnake Cable Company Beanie - in Montana, it can get cold up here. Beat the weather in style with a Rattlesnake Beanie! These are a 12" Cuffed Beanie in Dark Grey with our rectangle logo on a leatherette patch! Rattlesnake Cable Company Hat - Grey on Grey - Fidel Style Lid in Grey with our rectangle logo on leatherette, also in grey. Represent! Here at Rattlesnake Cables we love our direct interactions with the musician - allowing the musician to customize their cable builds and offering great customer service. Moving forward, this will NOT change, but we also understand that a lot of musicians are interested in picking up a cable at their local guitar store (especially with international customers). We are now offering 'dealer cables' in select music stores, while still maintaining our custom shop builds. Additionally, we will work with our dealers to offer custom builds through the dealership as well! If you are a dealer and are interested in carrying Rattlesnake Cable Company cables in your store, contact us to let us know about your shop! We like to showcase all of our builds on Facebook and Instagram. Below are recent images from Instagram account! Be sure to follow us on Facebook and Instagram for more examples.